Or was he really just an anti-Semitic, doddering cat lover with a mentally troubled wife? Many people don’t even know that he was born in St. Louis, so British does he seem, and he carefully made sure that image would prevail. He moved to Britain at age 25, during the first year of the Great War, and became a British subject in 1927. Looks like a college syllabus, right? Don’t let the “famousness” of the names deter you from closer examination, from really just immersing yourself in the imagery. Eliot is at his best, for me, when his points aren’t clobbering you directly, but are evoked, teased through, using mysterious and potent metaphors, similes, and other imagery to suggest rather than state. That probably says more about my French Symbolist outlook than Eliot, though he was well aware of those movements “across the Channel.” He had discovered the symbolists while still a student at Harvard, and lived in Paris for what I imagine must have been one magical year (1910/11). He “hung out” with Ezra Pound, who nicknamed him “Old Possum,” and the Woolfs. By the way, he ditched the wife in an institution and never even visited her. He remarried, but didn’t have any children by either wife. You can admire, even be astonished by, the work, without accepting every part of the flawed human being. Sublime and cruel have linked hands, somewhere behind the back, I suppose. 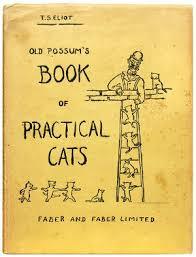 The “Cats” poems were deliberately lighter “doggerel” (sorry!) from 1939, that owe their fame to the unfortunate and banal musical trappings added to them by Andrew Lloyd Webber. Investigate, with an open mind/heart, form your own opinions.